I've decided to join the 52 Weeks of Happy project, started by Little Birdie; this is a project she started last fall and I think it's really wonderful. The project involves a post per week where you share four photos of things making you happy. The idea is to focus on the little things making you happy in life. I want to try to do mine every Monday. I'll start with yarn. Yarn always makes me happy but right now it's especially exciting because I have a new project planned. I love that moment when a new project comes to fruition in my mind. I already bought the yarn. I'm trying to be frugal, so this is all inexpensive acrylic yarn from Hobby Lobby, a chain crafting store. 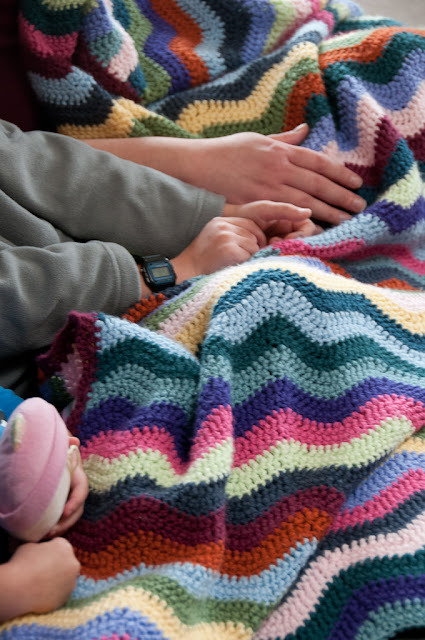 Some of it is their house brand, "I Love This Yarn," and some of it is Vanna's Choice brand. But I love the colors and I'm excited to begin this hooky project soon. I am always happy about books. I got several for Christmas, including two crochet books and Jamie Oliver's Food Revolution cookbook. I will share more about these books another time, but books are really making me happy right now. I mentioned a few days ago that I am currently reading Gone Girl and I'm enjoying it a lot. I also just got the new Ina Garten cookbook from the library, where I'd been on the waiting list for it awhile. I am a big fan of Ina. Here's one of our many burgeoning bookcases. Yesterday morning, we all went to the local zoo with our friends. They have a daughter just a few weeks older than the GB. It was very cold outside and most animals were fairly inactive, if we saw them at all, but we enjoyed our visit very much. In the polar bear exhibit, the sun was shining through the water onto the rocks of the "cave walls" you stand inside to watch the polar bears in their swimming tank. 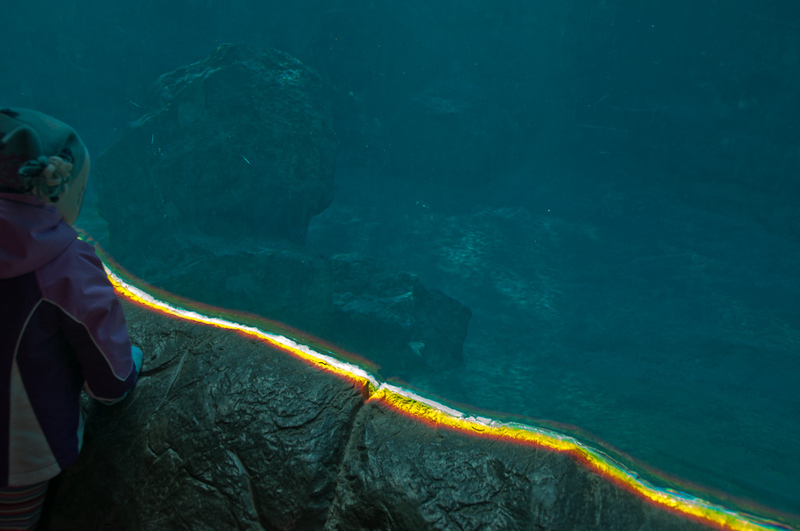 The sun made this beautiful skinny rainbow all along the edge of the cave wall where it met the glass of the tank. The GB was fascinated by the rainbow. Finally, I've been cherishing the cold weather because it means lots of snuggling under blankets. It gets so hot here in the summer, and summer is so long (roughly late April through October) that we relish the colder months. My small Bears and I spent some time under my Ripple afghan yesterday afternoon. I love these little people. I think this project is going to be good for me. It will make me slow down and really notice the little things in my day. It will give me another way to be thankful for everything I have. I've heard so many good things about "Gone Girl" I think I'll add it to my reading list. Hi Jenny! Thanks for visiting my blog. I'm enjoying Gone Girl a lot! It was a bit slow to start but it's getting better as I progress through it. Jen's 52 weeks project is great fun, I'm glad you've joined in. Great happy things - I love the rainbow colours in your yarn choices.